One of the best ways of moving away from fossil fuels is through the use of renewable energy. 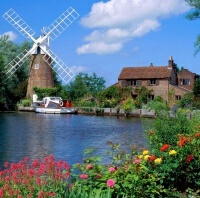 Wind power is a clean, green way of generating energy, and it’s been in use in the UK for centuries. All renewable energies have different benefits, but for the United Kingdom wind energy in particular has huge potential, especially in Scotland, Wales, and the hilly and coastal areas of England. It is a mature technology, and is in position to make a significant impact in the fight against climate change, by reducing carbon emissions. The turbines themselves have a very small footprint, so farming around their base is easy. With no fuel costs, and a known price for the electricity, it is possible to calculate the likely annual revenue. Whilst the wind does vary, over years the average energy produced can be estimated accurately. Wind turbines can be installed within a year, while conventional power stations can take over a decade to design and build. Because the power is generated from the wind, no fuel is required. This means less gas and oil needs to be imported, improving the energy security of the country by making us less dependant on the global oil price and the whims and vagaries of fortune. Energy from the wind will help the United Kingdom build a secure and sustainable future. The UK Government realises these benefits and has instituted a Feed In Tariff which has created fixed prices and certainty in renewable energy economics. You can read more about the Feed In Tariff here.